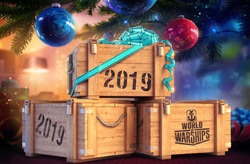 World of Warships New Year's Gifts! 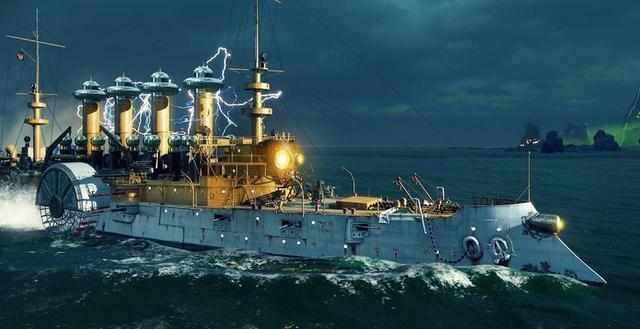 - The World of Warships fleet features ships, dating back to World War I. 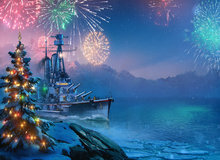 World of Warships New Year's Gifts! 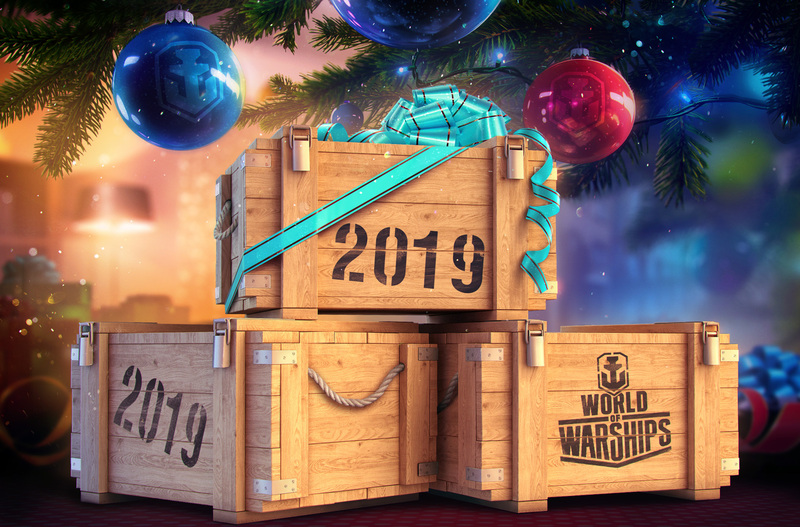 The World of Warships fleet features ships, dating back to World War I.
Download trialWorld of Warships New Year's Gifts! Hurry Up and Get your World of Warships New Year's Gifts! NB: These bonuses will be received by all New users who will register before the end of the year. Windows XP/ Vista/ 7/ 8/ 10; Processor (CPU): A processor with at least two (2) physical cores supporting SSE2. Memory (RAM): 1.5 GB for Windows XP SP3, 2 GB for Windows Vista / 7. Video card: GeForce 6800 with 256 MB RAM / ATI HD X2400 XT with 256 MB RAM, DirectX 9.0c. Sound card: DirectX 9.0c compatible. The game is available for , but the winners of our contest will get it for free. 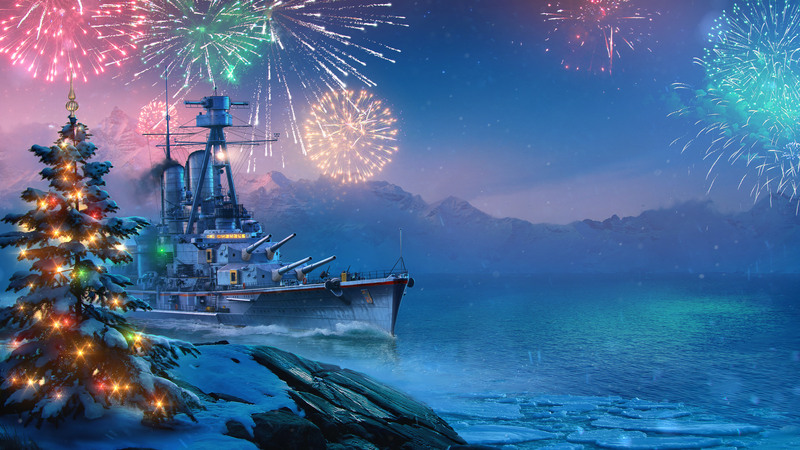 Comments on World of Warships New Year's Gifts! I sorted my computer yesterday. And to be sure changed all my email and important account passwords. Someone definitely attempted to access one of my accounts, but I'd added two step authentication so they were not able to gain access. My son tracked the culprit to Kiev. We have family all day today, so I won't be around to moderate much. 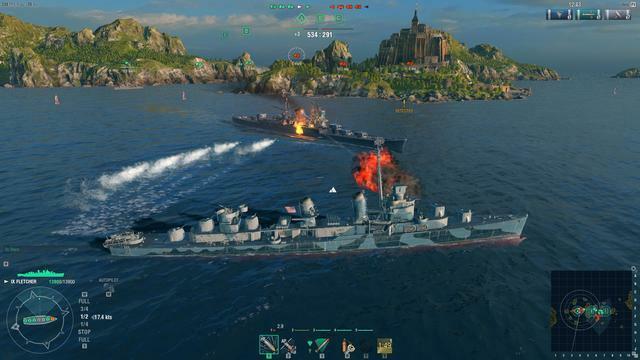 World of Warships is a free to play massive online multiplayer game with a coop mode. As with yesterdays World of Tanks, there is nothing to download from the giveaway site for this game. 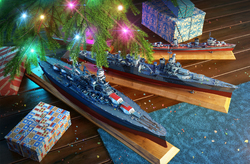 Once you complete the task, you will be emailed a link to the World of Warships site. Follow that link and create an account. 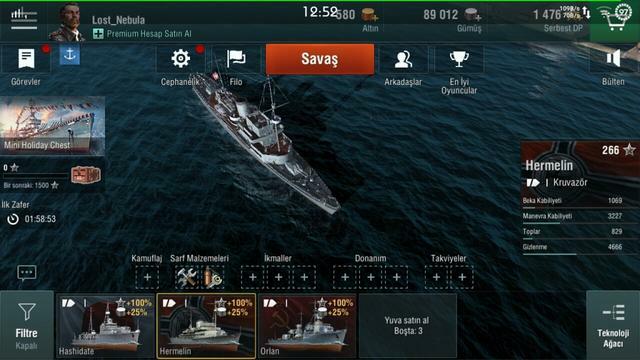 The Free Premium ship – i.e. Nassau plus 500 doubloons and 2 million credits should then be added automatically to your account. Please note, this offer is only for new accounts. If you already have an account, the above giveaways will not be added to that account, but you should be able to create a new account to take advantage of the offer. Once you receive your email, you must create the account by the 31st December 2018 to take advantage of the offer. Historically, the battleship never really had its day. There was just one major battleship clash in World War I (which ultimately proved indecisive) and America's entry into World War II came at the exact moment carriers rendered the battleship obsolete. Fortunately for fans of these undeniably cool floating weapons platforms, Wargaming.net’s World of Warships gives World War II-era naval combat the design balance that history so often lacks, creating heavy-metal slugging matches that test tactical skill. 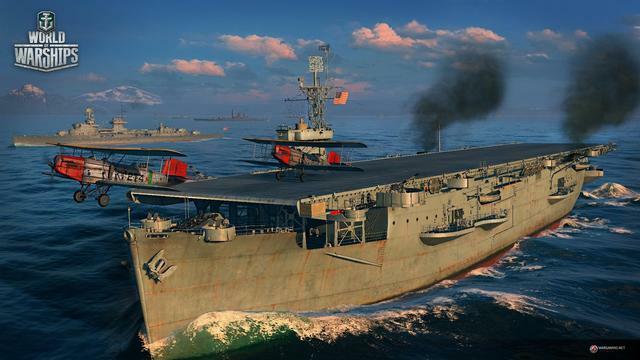 Carriers can still rain death from above with bombers, but they're trapped in a naval cage match where carriers, cruisers, battleships, and destroyers all have distinct and important roles to play in its free-to-play 12v12 multiplayer fleet battles. 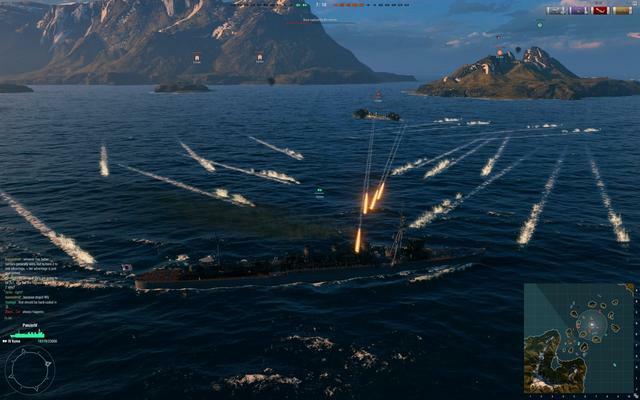 The heart of World of Warships is gunnery. 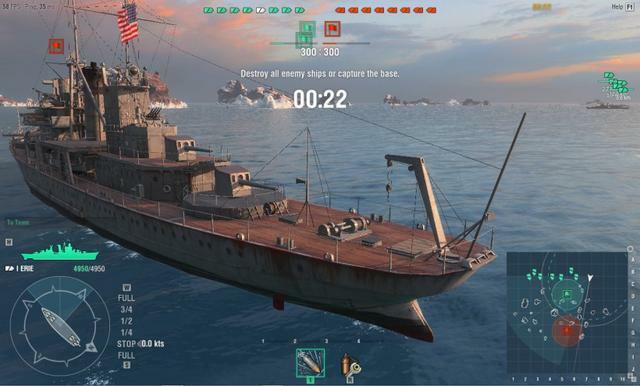 I've probably spent over half my time in Warships looking at distant warships through zoomed-in gunsights. Fortunately, shooting in this game is a lot more demanding than in your typical first-person shooter, or even Wargaming's own World of Tanks or World of Warplanes, and involves a whole bunch of skills and instincts. 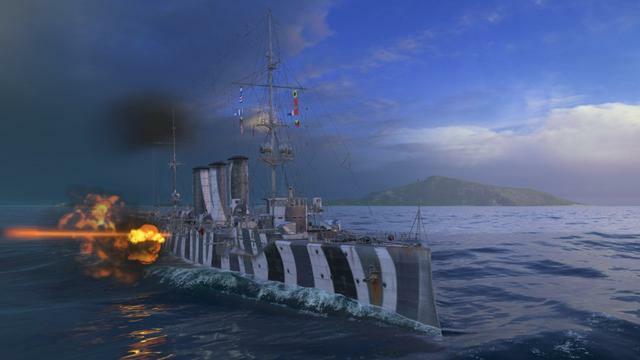 Early warships are deceptively simple, as they shoot each other from a few kilometers apart, and it often seems like combat boils down to simply leading you target a little bit and pulling the trigger. But by the time you're playing around with your first battleships, gunnery requires a mix of aim, mathematics, geometry, and attempted telepathy. The biggest warships hit hard, but their mighty guns can only fire a few times each minute, meaning that a missed shot leaves your opponent’s guns fully operational and you exposed for an eternity. Meanwhile, those shots can take something like five to 10 seconds to reach their target. An enemy warship can cover an awful lot of ground in that time, and it can maneuver to avoid incoming fire, so you have to not only figure out where your shots will land in relation to the enemy vessel, but also read what the enemy captain is going to do when he sees you fire. Torpedo ships like destroyers and light cruisers also have to make these calculations as they try to make their slow-moving torpedoes hit home against an enemy that sees them coming. As frustrating as it can be to see long-range shots make their slow journey across the sky, only to land far behind their target and a few yards short, success makes it all worth it. Correctly anticipating your adversary, gauging the distance and travel time of the shots, and delivering a crushing salvo that instantly shatters turrets and sets fire to the superstructure is unbelievably satisfying. So much went into that moment. 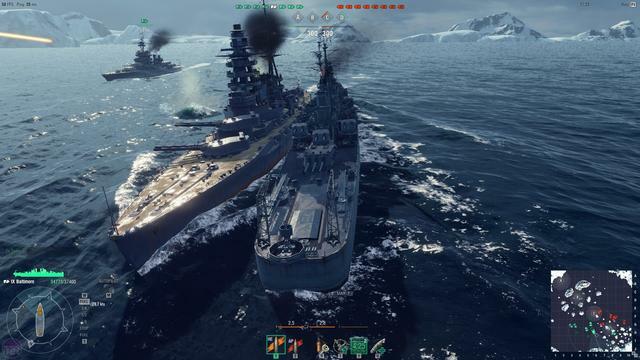 Yet battleships and cruisers are only effective when they can actually see their opponents and overwhelm them with firepower before the same happens to them. 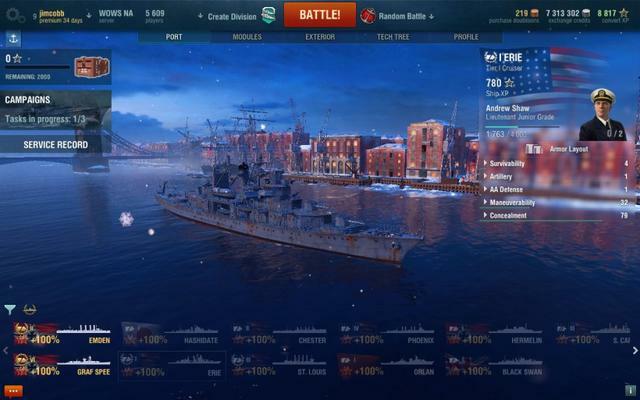 This is where World of Warships really begins to sing as a team game… and also where it falls down the most on a regular basis, thanks to the vagaries of online matchmaking. Every ship class is dependent on every other ship class. A carrier is a sitting duck unless it's protected by the ships with the guns; cruisers are more self-sufficient than any other class thanks to their versatility, but they're also limited in what they can accomplish without support from specialist ships; destroyers can't last five minutes under fire, but they can scout, harass, and ambush like no one else. 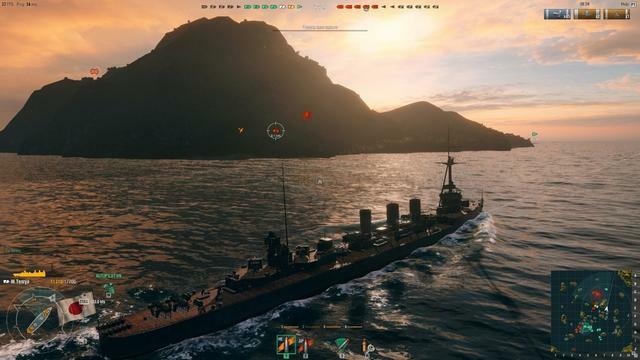 For a team to succeed in Warships, these classes have to work together, and it's a thing of beauty when they do. When you're on a good team you'll see destroyers setting smoke screens to conceal the direction and location of your fleet, then start scouting and blind-firing torpedoes down likely avenues of enemy approach. Cruisers will range out ahead of the battleships to intercept enemy destroyers and locate the main enemy force, or they will play rearguard and keep the carriers safe from harassment. 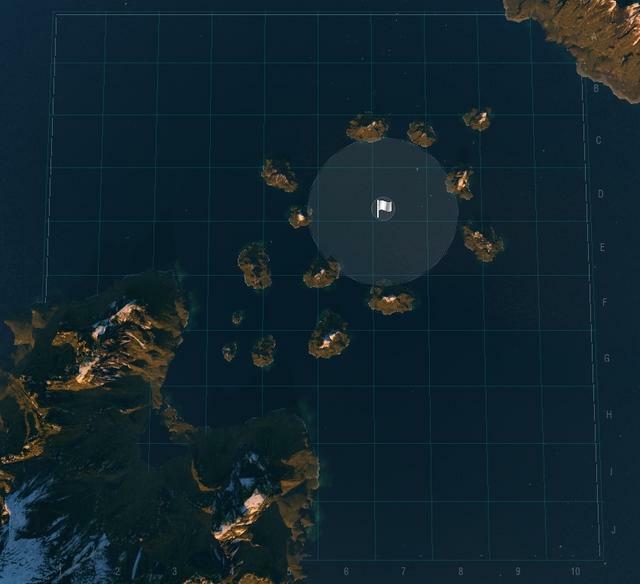 Battleships will lay a course taking them across a vital section of the map so that they can rain death on anyone their teammates find, while carriers chase off enemy air attacks with automated fighters and send in bombers to exploit opportunities and weaknesses. 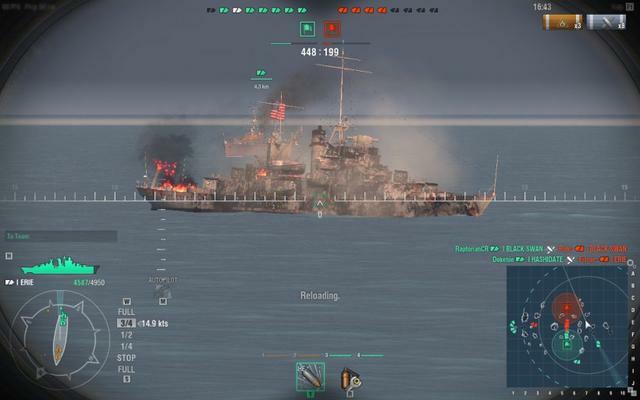 But you're still dependent on the other ships to play their role, and if a team doesn't coalesce around some overall strategy, World of Warships can be an express elevator to Hell. It’s good that a single skilled player can't just dominate a game alone, but unlike in World of Warplanes, where mistakes tend to results in swift defeat, battles in Warships take much longer to play out -- no matter how futile they are. Short of abandoning games, these matches can drag on. I've spent 10 or 15 minutes with my last remaining teammates just waiting for the enemy team to find us and kill us, or put us out of our misery by capturing our base and winning the match via objectives. If your team’s destroyers all go on a suicide torpedo runs at the start of the battle, the bigger ships will be left blind almost helpless as the enemy maneuvers around them and sneaks in close for kills. 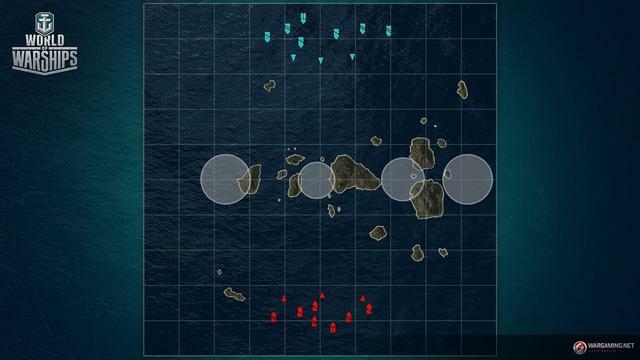 If a battleship player decides to stray away from the main battle, your entire fleet will slowly get shot to pieces because there is nobody who can do the damage necessary to take out enemy battleships. If your carrier wastes all its fighters, ships will be picked off one at a time by enemy bombers. It only really works if people end up - by accident or design - working together. That's not really a comment on the community. While there are a few heedless fools or team-killers (who don't seem to be weeded out as effectively as they should be – I saw the same teamkiller griefing in multiple games), most players do try to work together, even if no words are spoken. That said, that focus on teamwork and the clear distinctions between classes makes Warships a little richer and more rewarding than, say, Warplanes. By Tier 4 in Warplanes, I kind of felt like I'd seen everything there was to see - dog-fighting with faster and more lethal planes isn't THAT different from dog-fighting with worse ones. But in World of Warships, I’ve had a lot more diverse experiences based on what game mode we're playing and what ships have shown up to the battle. 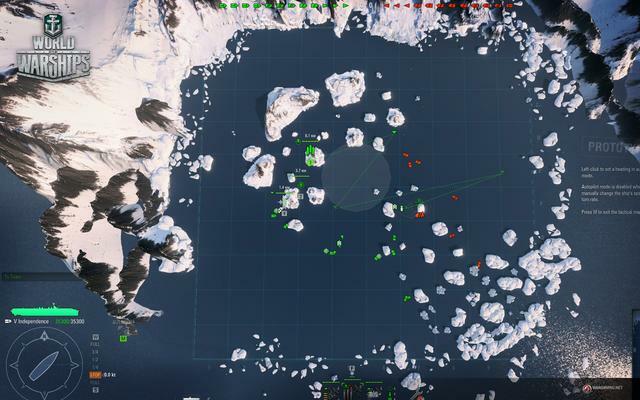 There is a control point mode in which the two fleets vie for control of three strategic locations on the map, and a more traditional team-deathmatch in which the two fleets fight either to eliminate each other or to capture the enemy's home base (which usually only happens after one fleet has been soundly beaten). Higher-tech ships don't just feel like better versions of the stuff I already had, but also force me to improve some skills and develop new ones. 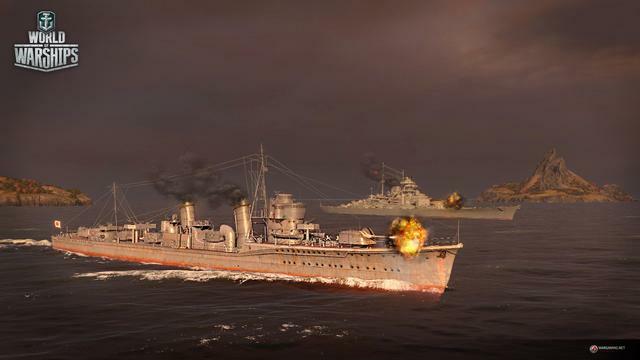 As the gun-ranges get longer, as the ships get get faster, and as more special abilities like air-defense boosts and spotter aircraft become more critical to helping your team, World of Warships is constantly demanding better shooting, better piloting, and better teamwork. Progression is especially rewarding because each ship looks sleeker and more beautiful than the last, with boxy, smoke-spewing old rust-buckets replaced by long, low greyhounds that seem to knife through the water. I haven't talked about the payment model yet because it does an excellent job of staying out of the way. 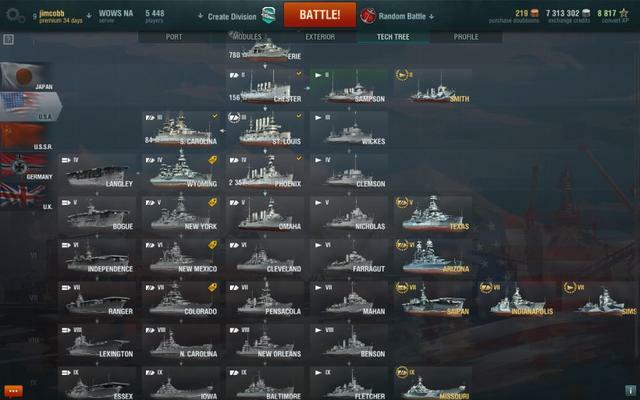 Warships starts to feel like a pretty complete package once you've unlocked every ship class. It does require a ton of games to climb the tech tree from Tier IV onward, but since I was hopping between tons of different ships, I didn't feel stifled. There is one noticeable exception, however: the fact that you can only maintain a handful of ships at a time without paying premium currency does feel like a bit of a straitjacket, and I definitely felt forced into selling some ships before I felt they were played out. 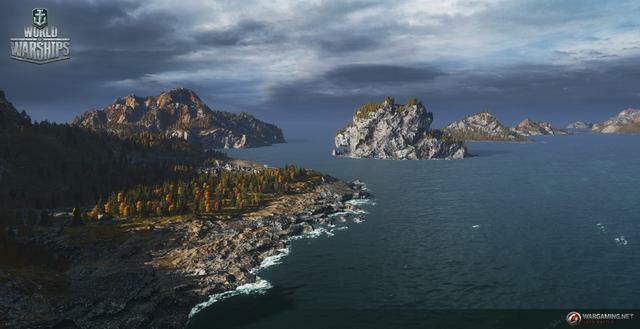 When it all comes together around two competent teams working together, World of Warships is a glorious pre-World War 2 admiralty fantasy come to life. This is Wargaming's richest and most rewarding team game to date, with the most diverse set of classes and skills of any of its games. 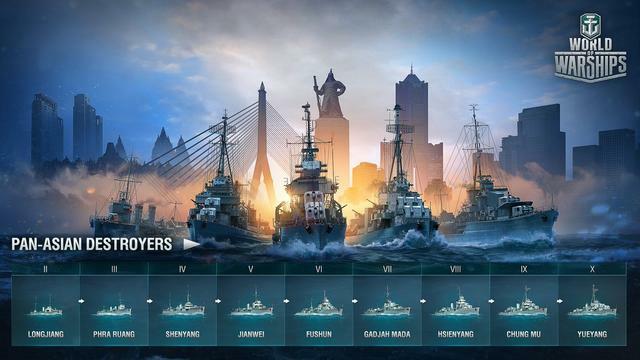 The irony is that this also means World of Warships is also the least consistent of its games, with higher peaks at the cost of lower valleys while you wait out games that have already been decided. But the view from those peaks more than makes up for those dives beneath the waves. You can see other reviews and overviews of World of Warships HERE, , HERE, HERE (parents views), HERE, HERE and HERE. You can also find the World of Warships official forums HERE, where you will probably find answers to most questions asked about the game. 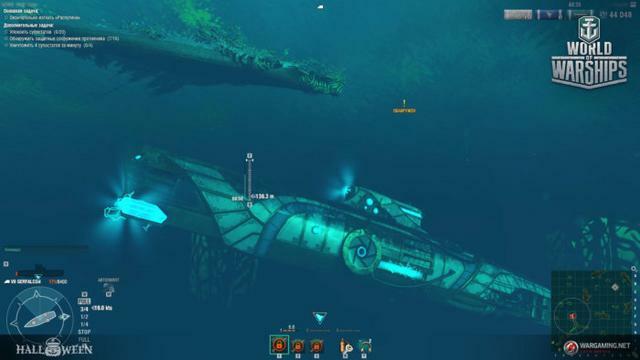 The following are links to several in-game videos of game play HERE, HERE, HERE, HERE (Useful Tips), HERE, HERE (submarines), HERE, HERE & HERE. 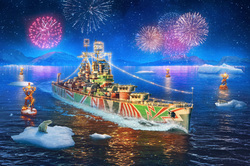 If World of Warships doesn't interest you, but you still hanker for something new to play, you'll find details of some game deals whether they be sale items, indie bundles or games being given away for free HERE (I've not updated the thread in a while, but most of the links still take you to the latest deals). Click share button, wait. Wait some more. Still waiting...... guess what? No link. Hi Bret, did you check your email? If you've used a different email in the past, it may have been sent t that email. As I mentioned the other day. When Steam keys were first given away a few years ago. some community members applied for multiple keys then sold them on a Steam keys site. The giveaway team implemented security to try and stop such selfish behavior, one of which was keeping a record of the first email you used to register for keys. This is then always used, (or at leas to my knowledge was). I applied for a link and received it seconds later. Bret, I have the same email addy I have had for the last 15 years. I looked in my junk folder as well as my trash. Simply, it never came. Hi Bret, There has to be some issue causing this problem because the giveaway team would have sent you the link if all was well. Maybe there is a security issue or a conflict with something running on your computer; I really don't know what the issue could be? As I said before, I received a link within seconds of completing the task. I would contact the giveaway team using the contact link I've included near the end of the review and explain the problem. been playing this for a few years now. A true free to play game. Yes there is " premium" currency and ships but they are not impacting on the gameplay off those that do not buy premium. It is a slightly lesser grind to get to higher tier ships as your doubloons will accumulate a bit faster but Premium ships are not better than non-premium ships. Like I said, been playing for a few years, never paid anything yet I have several premium ships and a few thousand in Gold (premium currency) just by playing the game. You can choose to go allround and run all types of ships (Cruisers, Battleships, and destroyers. Or, like me, can specialize. I specialize in IJN (Japanese) Destroyers. Loads of fun, easy to learn. The Facebook button isn't working for me. I click on it but nothing happens. The "Facebook Share" Button that is.